It is easy to embed Youtube video HTML into a blogger blog such as this one you are reading right now. Obviously the you tube video website is owned by Google and so is blogger so there should not be a problem. However if you want to embed Youtube video into a WordPress website then we have a different story. How to embed Youtube video into a WordPress website? Under every video on Youtube has a button below it called Share. If you press on this button you can then press on the embed button to see the code you need. If you Wanted to embed video code into a blog our blog you could simply just copy the code that is there. However if you want to embed video into a WordPress website, you will need to tick the box next to where it says use old embed code. This is the code that you can insert into your WordPress website HTML section. It will not accept the Iframe code that is now used by Youtube. In the screen shot above you can see where to tick the box. As soon as you do this the code changes to the old style code that is compatible with your WordPress website. 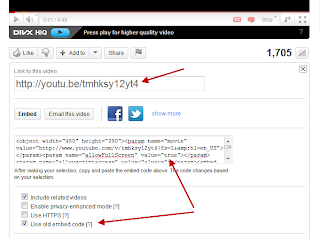 See the full instructions on how to embed Youtube video html into a WordPress website. How to embed Youtube video into a blogger blog? Embedding Youtube video into a blogger blog is just very easy. 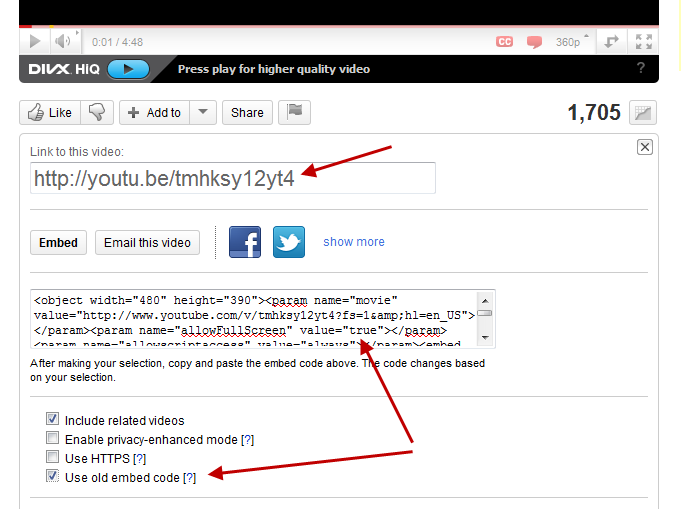 You can get the code off Youtube yourself and go to the edit HTML tab above and paste the HTML code in there. Here is a video from Youtube that has been embedded into this website.